I was running errands Sunday when I got a song stuck in my head. Actually- just one line in particular from Leonard Cohen's "Anthem." 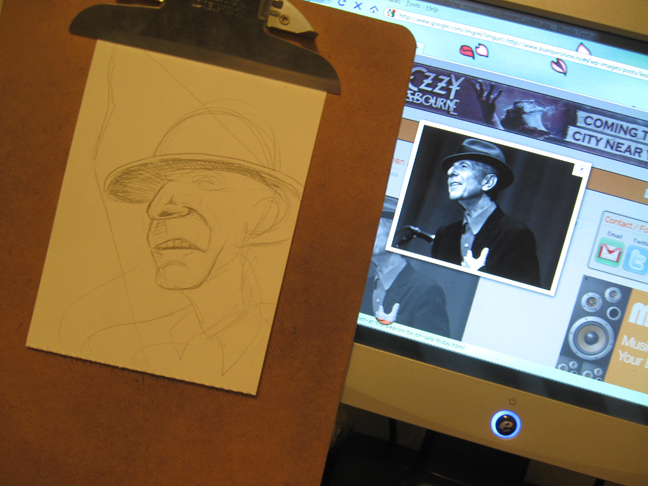 I began sketching Cohen's profile from a picture off the net. If I'm doing a larger piece with multiple reference photos, I'll usually print them but tonight was just a small 5 x 7 portrait. I start out loose, just trying to get the general layout and spacial settings, them start hashing out the details.. In many mediums, you go dark to light. With markers, I've found it depends on the situation and I often go back and forth. 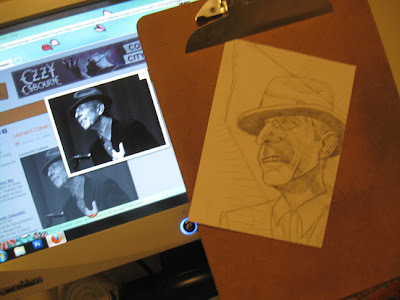 Most of the time I'll get my background done and then start adding my highlights to see where my light source will be. You can't really add a light area over top of a dark one with my medium. 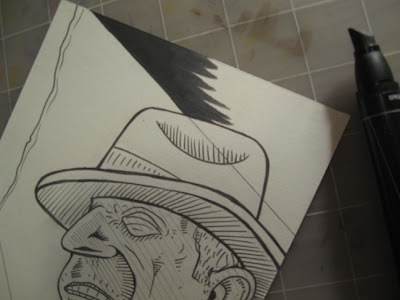 I lay some grays down first to get some depth on the "crack" and let the light in with three different hues of yellow. 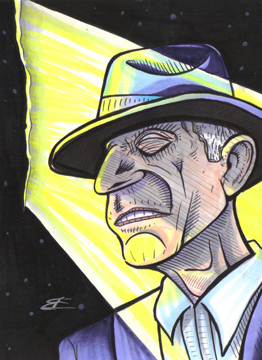 Click HERE to Order an Artist's PRINT of this Leonard Cohen Portrait! This portrait is outstanding !!!! those are two of my favourite lines by Mr. Cohen too! i love the strong lines in this portrait and the colours in the palette. the 'light' has a beneficent warmth and the 'crack' is perfect. great work anyway, and i'm glad to see such a brilliant artist so finely celebrated.